B2B sales cold calling is very much alive because it is still one of the most effective ways to add sales qualified leads into your pipeline. In this article, we focus on how to write a cold calling script, which is ideal for beginners to help guide their conversations. We also have an alternate guide that covers cold calling strategies in general. What Is a Cold Calling Script? 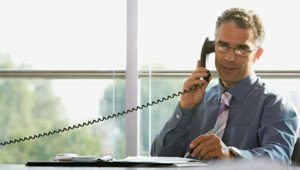 A cold calling script helps salespeople structure their first contact phone conversations with prospects, when they pitch their products/services to secure meetings. Not necessarily a word-for-word script, this document is more of a training guide. As salespeople gain experience, the goal is to become less dependent on cold call scripts and more capable of improvising. 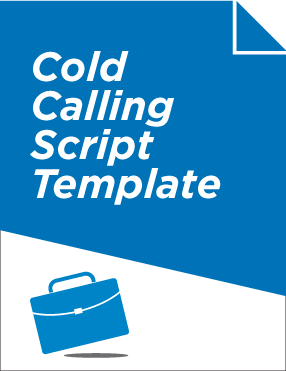 You can also download our cold call script template to begin writing your own script as you follow this article. Just keep in mind: no cold calling script is meant to be followed verbatim. Make sure you’re leaving a lot of flexibility, and writing out plans for many different customer objections. Although you’ve probably already done your research, the first thing you say, should be to confirm that you’re speaking with the right person. This type of introduction is direct and recognizes their role, although I would not provide my name or the business that I am calling from unless they ask for this. I’d also keep it relaxed and confident without being too informal. Then avoid going on to say, “Hi [Jeremy], how are you today?” because it gives your prospect a chance to jump in and disrupt your flow. Cold calls are all about taking control in a relaxed and natural way. This is difficult to improve upon. You need to tell them who you are, explain who you represent and avoid an unnatural or fake dialogue. For instance, it would be fake to ask straight off, “Hi, how’s it going?” since you don’t know the person. Try to avoid empty gesture; it’s “salesy” and it will be picked-up straight away and cause your prospects guard to go up. But if Jeremy says “yes,” I know I have his attention and I can proceed to tell him the reason for my call, which we get to in the next section below. This approach achieves the objective of being polite and avoids being cheesy or fake. You will be surprised how this disarms someone as you give them the option of deciding when it would be best to speak. Be careful not to ask, “Are you busy right now?” Of course they are busy, and even if they are not they will likely pretend that they are, especially when speaking to a stranger. Dive right in to demonstrate that you’re a sales professional. Save the small talk for your follow-up calls after you’ve built a relationship first. Then communicate your value proposition or a pain-point. It’s worth experimenting to see which works best for you. This works well if to disarm most prospects to properly consider your proposition. Why? Because it’s the exact opposite of what pushy sales people would say. Personally, I would always want to ask some qualifying questions to make sure that the person I am dealing with is in my target market, will see the value of purchasing what my business has to offer, and as the ability to do so. This conversation could elaborate a little but be careful not to start selling or take too long because the real objective of this call is to start building some trust and secure a meeting date. “You know what, it’s a bit of a conversation, and I want to learn more about your business first, so do you have 30 minutes available to meet with me next week? How are you fixed at 10am of Tuesday or 2:30pm on Thursday? This whole conversion is is likely to last less than 5-minutes if it’s a proper cold call. The key is to say what you need to say and no more, then ask for the meeting. It’s important to keep in mind that the purpose of a cold call is to earn the right to meet and sell your product and not to try and sell your product on the cold call. If you approach the call with this could it is relatively easy to deal with even the most challenging objections that they may raise before they really know what you have to offer. There are only likely to be around 5-10 objections that you regularly face so try to think of those in advance and draft a good response for each. Once you have your objections and answers in place, you can start calling to test how they work so that you can refine and improve them. If you hear a fresh objection that you have not come across before, you’ll have to think on your feet and improvise. Then after the meeting, you will be able to consider how you responded, add the objection to your guideline and consider a more effective response for the next time this comes up. With a true cold call, your primary goal is to gather information and secure a meeting, which is your opportunity to sell. As a result, 80% of your cold call should be spent on the prospect and only 20% on you. Most salespeople fall into the trap of reversing this, talking primarily about themselves, their business and their products. From the prospect’s point of view, this feels like the salesperson is trying to sell them something and this should not be the purpose of the call. However, it is important to spend 20% on me, my business and my product as you want to give your prospect a good reason to want to meet. Though it’s important to know when to stop, which we cover further below. In the old days, before people could Google to find out about products for themselves, cold calling scripts were fully scripted and salespeople were often expected to follow them precisely. The net result is that they sound robotic and unnatural. I would strongly recommend that you avoid doing this, or inflicting this on anyone else. Why? Because natural salespeople do not like rigid sales scripts, and they often produce poor results. Instead, create a cold calling script to use as a guide or framework with sections that are modular. This way you can flip to the section that you need and get prompts that you need, even during a call, without trying to memorise or follow a cold calling script verbatim. A lot of people assume that a cold calling script is literally memorized verbatim and then repeated. The problem with this is that it makes you sound wooden and robotic and when your prospect takes you off script, you will struggle to follow the conversation. Instead, view a sales script as a guideline or modular framework that you can you to help you make a plan when you start to sell a new product or service. View it as a live document that you can refine and improve as you make more calls. Finally, you will need to make a note of everything that you learn during your sales call. You can do this more easily by adopting a sales CRM tool like Insightly that make it easy for you to create notes, set yourself tasks, and set appointments. You can also record your sales calls so that you can relay them and learn from them to improve your cold calling sales script. Great piece Mark.I found the article so resourceful. I am a social media marketer at Fossilcote Limited. We deal in Epoxy floors, Polyurethane Floors and cementitious coatings, stucco and cement paint. Please help me with a free sample cold calling script for such products. Thanks. Many thanks for your kind words, I’m afraid I do not have the cold calling script you are looking for. I recommend you take a look at Sales Scripter which sounds like just what you need and is affordably priced for small businesses users. Thank you for having the information I needed to hear to move forward. You’re welcome — thanks for dropping in!